Healgel Intensive | £37.50 // This is one of my favourite products and I already have the full size. I use this to help heal my eczema which scares easily as well as other scars I already have. Plus it also works as an amazing spot treatment. Liz Earle Eye Bright x 2| £13.25 // I've gone through countless bottles of Eye Bright over the years and it's a staple in my skin care routine. I use it to remove my eye make-up when my eyes are feeling irritated and as an eye mask when they're feeling tired and need a refresh. 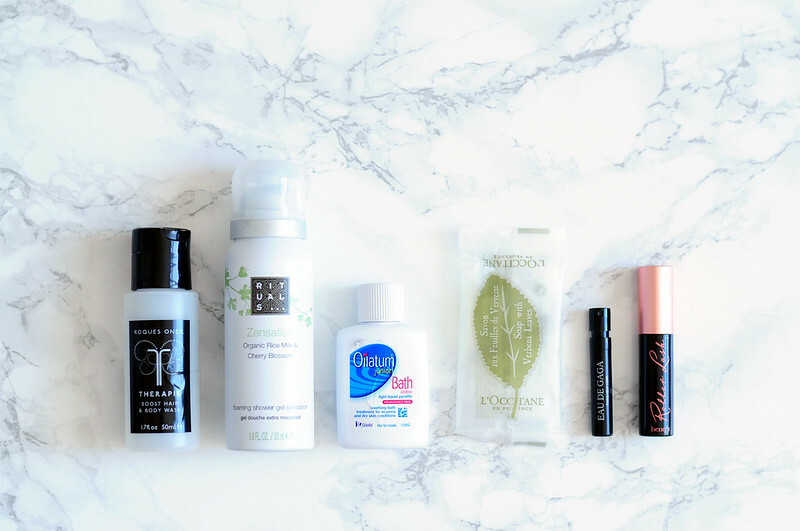 These mini bottles are perfect for travelling and I already have a full size bottle that I'm using. 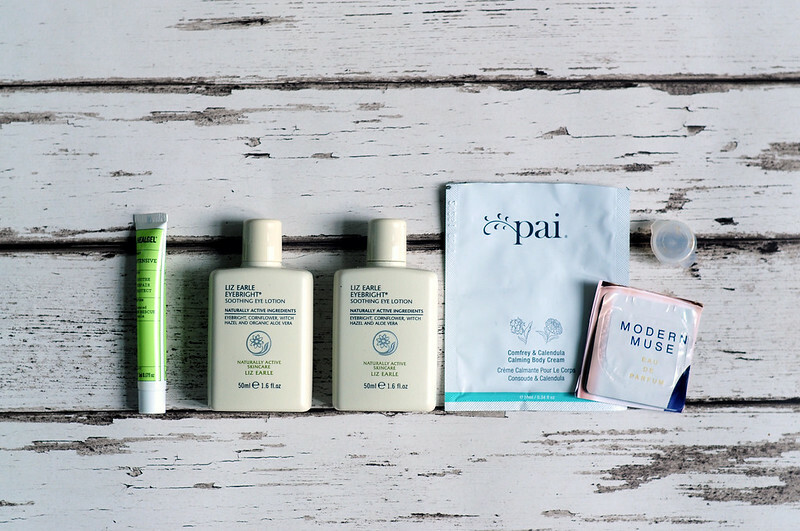 Pai Comfrey & Calendula Calming Body Cream | £22 // I forgot how much I loved this body cream and although I only got one use out of this sachet, it's made me want to buy the full size so much. It's moisturising, but doesn't feel heavy on my skin and sinks in easily. I have a couple more body moisturisers I want to finish first, but this will be my next repurchase. Dr. Alkaitis Organic Replenishing Serum | €49.00 // This was a free sample that came with an order I placed from Amazingy and sadly there was only the tiniest amount inside the mini pot that I couldn't really use it. It was nowhere near enough to cover my face, I think I probably was only apply to apply it to one cheek! Dr Alakitis is a brand that I would like to find out more about and the products. Estée Lauder Modern Muse | £45 // I like this perfume but I don' t love it and won't be buying the full size. Roques Oneil Therapie Boost Hair & Body Wash | £17 // Although I don’t think I’d spend £17 on a shower gel when I can find good ones in the drugstore, I was surprised with how little I product actually I needed with this one. I took this mini bottle away with me on a long weekend and I probably only used about a tenth of the bottle and that’s with daily showers. I thought I’d easily go through the bottle in one or two uses! I wouldn’t use this as a shower gel simply because I have a sensitive scalp but it was really nice as a shower gel. The scent was different to how I imagined it would be going from the other products. It had a lighter fresh scent whereas the other products are more spa-like. Rituals Zensation Organic Rice Milk & Cherry Blossom Foaming Shower Gel | £8.50 // I think this is the second can of this shower gel I've finished and I really like it. It reminds me of the foaming shower gels I used when I was younger and the scent is really nice. I am nowhere near buying a new shower gel at the moment as I have way too many in my bathroom cabinet, but I would buy it again in the future. This also makes a great shaving cream as it foams up really well. Oilatum Junior Bath Additive | £9.19 // I have a million of these mini bottles of bath additive thanks to my friend who works in dermatology. They are the perfect size to take travelling as I always want to be able to take something with me to soothe my eczema if it flares up. I don't mind using the junior version as normally it's the only one in stock in Boots when I go to buy it. L'Occitane Verbena Soap | £4.50 // I took this away with me when I went to Brighton as it was the perfect size for a long weekend away. I really like L'Occitane soaps especially this verbena scent which has a hint of lemon to it. Lady Gaga Eau De Ga Ga | £30 // I was surprisingly disappointed with this perfume. I really like the original perfume form Lady Gaga and have nearly finished the bottle. This new scent though, I'm really just not a fan and I won't be buying the full size. Benefit Roller Lash Mascara | £19.50 // I like all the Benefit mascaras and Roller Lash is no different. I bought the full size pretty much straight away after trying this mini tube I liked it that much. It creates amazing volume and length! I love eyebright! It's so soothing! Also love those rituals shower foams!